Image-N-Concrete is attempting to educate Colorado builders and homeowners of the value and beauty of decorative concrete in residential settings. "We are showing homeowners how concrete floors can be as unique and exquisite as the homes they are building," said company owner Lorena Herriot. "We like to focus on smaller projects where there is a desire for a unique personalized design-like putting paw prints on a dog bakery floor, or including a portion of a company logo on the store entry. Our projects have ranged from residential to commercial, interior to exterior. We just completed a fabulous home in Castle Pines, Colo."
The decorative work in this home was on the 4000 square foot main floor of the 10,000 square foot home. The design challenge was to tie the multiple rooms and hallways together to provide continuity yet have unique designs in each room. To create the multiple looks, Herriot and her crews used a variety of techniques including stains, dyes, stencils, and engraving. Homeowners Paul and Kristen Brown, who are actually concrete contractors, wanted a somewhat traditional tiled look in the larger areas, such as the kitchen and great room but wanted it all to be concrete. 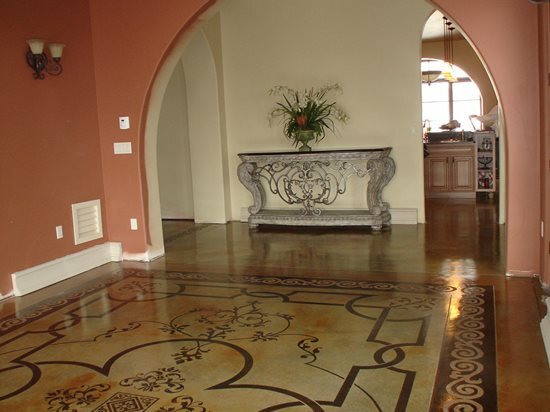 Image-N-Concrete differentiated between the two areas by using different stain colors and by varying the engraved tile pattern (using Engrave-A-Crete tools). 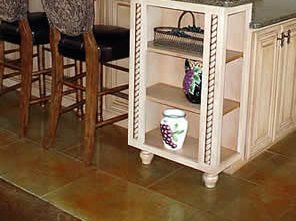 In the kitchen they used a lighter colored golden wheat chemical stain from Kemiko and engraved an 18x30-inch offset tile pattern. 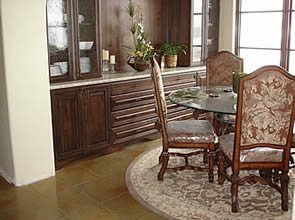 In the adjacent great room they got a richer look by using a Scofield dark walnut stain and a diagonal 5x5-foot tile pattern. The two worked beautifully together while still providing room separation. In the study Herriot decided on the same dark walnut color used in the great room but with a stronger mix to achieve a deeper darker color. The intent was to create a masculine look to blend with the walnut paneled walls. 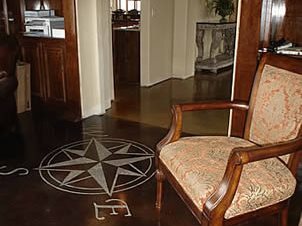 They completed the floors by adding an accurately placed engraved compass in the center of the room. "The foyer is very impressive with massive iron doors and "Gone with the Wind" spiral staircase," said Herriot. "Our challenge here was to make the floor equally as elegant." She accomplished that by incorporating aspects of the surrounding environment into the floor design--taking the design from the iron doors and engraving the pattern in circular form in the center of the foyer then dyeing the engraved portions black to resemble the iron work. In the parlor, which is viewed directly from the foyer, Herriot used a combination of two different stain colors, golden wheat and dark walnut, and engraved 30-inch intersecting circles. "By engraving the intersecting circles first, staining the entire floor the light color, sealing the areas that were to remain light, then re-staining with the dark walnut, we were able to give the floor and the room an expensive look usually achieved by marble flooring," she said. The dining room became the gem of the home. Here Herriot used the combination of stains, dyes, stencils, and engraving to create a 10x14-foot "rug" directly in the concrete. The process started with staining the entire floor with a golden wheat stain. 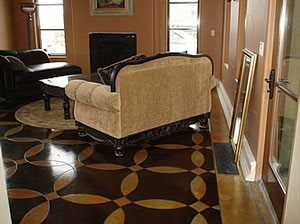 She then applied a Modello stencil and dyed the appropriate areas with a combination of black, dark chocolate, bark brown and amber from Smith Paint Products. The next step was to cut the border lines and seal the interior of the rug with a Brickform sealer then to again stain the area outside the border with golden wheat for a darker color but one that would still blend. The 12-inch border was the last area to be stained, using dark walnut then engraving the border pattern. "The result is a gorgeous, one of a kind conversation piece," Herriot said. Using the same two base colors throughout the house allowed Image-N-Concrete to maintain a cohesive flow. With all the different rooms and designs, a border design used throughout the hallways and between the rooms helped to pull everything together. In areas with light floors the borders were dark and on the dark floors the borders were light. In the end, all the rooms and hallways flowed together. Being concrete contractors, the Browns went all out with concrete on the exterior of the home as well. Their expansive patio was stamped as it was poured with a stone texture and on the driveway they went for a stunning wood plank look. "Our floors blew our expectations away," said the Browns. "They look absolutely the best! 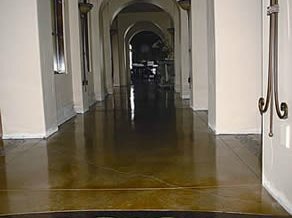 Everyone expects that concrete floors in a home will be cold and uncomfortable--then they see ours and are totally taken aback. Thanks for helping us create the look and feel we really wanted for our dream home." Herriot got involved with decorative concrete because she was looking for a way to combine creativity and handiness and did not want to do typical interior design or faux painting. 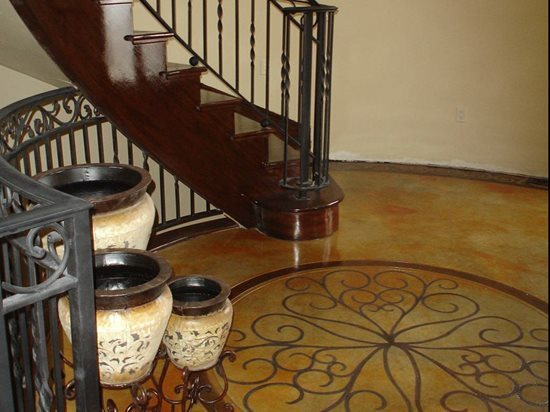 "While searching the internet I came across the Engrave-A-Crete website and was intrigued by how they could transform plain gray concrete with the use of their engraving tools and color. I attended their class in Florida and was hooked. I knew then, that I, a woman, could physically do this job and do it better than many. We bought the equipment and were off. Since then I have attended numerous seminars to expand my knowledge: from staining to overlays to concrete countertops -- and the suppliers have been an excellent source of information, too."